I am obsessed with her story,.I know she’s with the angels. And when I die I hope to meet her.love you. 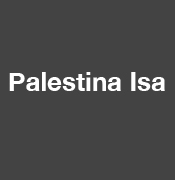 Palestina Isa did not do anything that i can see to dishonor her family. She was probably killed to silence her. Finding a part-time job is not dishonoring. From what I can understand, she was proud to be an American and her father disliked the fact that she had American friends. There is nothing honorable about honor killing. Given that logic, an honor student could be justly murdered for not having straight As! I just wanted to say that Tina is NOT FORGOTTEN.